The nation of Mongolian nomads, which first formed a constitutional unit, and harassed Eastern Asia for many centuries, bore, according to Chinese authorities, the name of the Hiung nu. The similarity of the name with that of the Huns, who later flooded Europe and heralded the great migration of nations, has long been noticed, and Joseph de Guignes (1721-1800), the first real student of the history of Central Asia (" Histoire ge'ue'rale des Huns, des Turcs, des Mogols et des autres Tatares occidentaux," 1756-1758), had declared the Huns to be kinsmen or descendants of the Hiung nu. It was left, however, for Friedrich Hirth to corroborate this conjecture by convincing proofs. One may therefore designate the old Hiung nu (Hiun yun, Hiun yo) by the indisputably more correct name of Huns. They appear in the Indian epics as Huna, in the Avesta as Hunavo, in Greek accounts as Funoi and Unoi. Linguistically the nation was most akin to the later Turks. The kingdom of the Huns was formed in the modern Mongolia, about 1200 BC, apparently under the influence of a Chinese exile of high rank, who created out of the scattered hordes the beginnings of constitutional unity on the model of his own country. In the preceding century some of these hordes had made inroads on China, but were unable to achieve great results. After the unification of the Huns, and especially after the beginning of the Chau Tschau dynasty in China (1122 B.c. ), which marks the commencement of the Chinese feudal system, the danger became greater. The scantiness of our sources of information prevents us from deciding whether any connection existed between the wars against thft nomads and the growth of the feudal system of partitioning the land. The first ruler of the Chau dynasty, Wu wang, had still maintained friendly relations with the Huns, who certainly feared the power of the empire which had gained fresh strength under his government and tried to buy his good-will by presents. As the imperial power decayed, the attacks were renewed with increased force. Northern Shansi was laid waste in 910. Some decades later the Huns must have been driven out from the heart of Shansi, where they had established themselves, by an army under the personal command of the emperor. There was a recurrence of similar events. There was apparently pasture land enough in China at that time to attract the nomads to a long sojourn, just as afterwards small hordes of nomads frequently settled in the interior of China. About 700 BC the Huns advanced to Shantung; in 650 BC they devastated Pechili, and there was a succession of attacks on the country, disintegrated by feudalism, and incapable of any combined resistance, until at last the ruler of the Chin Empire, under the name Shi Huang ti (246-210 BC), once more transformed (in 220 BC) China into a real united State, enormously increased his power by the conquest of Southern China, and proceeded to take prompt and decided steps against the nomads. A powerful army drove out the Huns from the countiy of Ordo within the northern bend of the Hoangho, which was an important position as the rendezvous for nomad invaders. The new possessions were protected by military colonies, but China proper was defended against the attacks of predatory hordes by the gigantic rampart of the "Great Wall." Portions of the Great Wall already existed on the frontiers of some earlier feudal States. Shi Huang ti connected them so. as to form a continuous line of defence, which stretched from the shore of the Yellow Sea to the port of Kansu, and, if it had been kept in repair and efficiently defended, it would certainly have checked the inroads of the Huns. During the first period it served its purpose to some extent. It was due to the Great Wall that the attacks of the Huns were now directed against another quarter, and remote regions of Asia indirectly felt the mighty shock. But the chaotic condition into which China relapsed immediately after the death of Shi Huang ti soon stultified the object of the stupendous erection. It was then that the power of the Huns was acquiring new strength under vigorous leaders. The age of Shi Huang ti marks an era in Chinese historical composition, since this emperor by the great burning of the books had almost destroyed the ancient Chinese literature, so that only scanty and bald notices of the period preceding him have come down. It is only after his reign that there are more copious sources of information. Our first comparatively accurate account of the constitution of the Huns dates from the period subsequent to the death of Shi Huang ti. The eyes of the Chinese were then turned with anxious attention to the increasing power of their nomad neighbours. The new growth of the Hun Empire began under the rule of Mete (Maotun, Meghder ?) 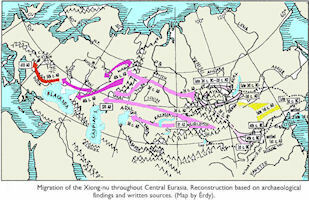 whose father, Tuman (Deuman), had already extended his power from Northern Mongolia to Kansu. Mete, who would have been excluded from the legitimate succession, murdered his father with the help of a devoted army, and was soon able to reanimate the old warlike spirit of his people. He found the territory of the Huns, shut in by powerful neighbours on two sides. On the east the Tunghu or Wu hwan, Tungusian tribes, akin to the Koreans, had founded a powerful realm and felt themselves so superior to the Huns that they took advantage of the usurpation. to claim a high price for their neutrality. On the southwest on the Altyn in Tagh were settled the Yue tshi (Jue-tchi), a nomad people of Tibetan stock, who were the connecting link of the trade of China and the West, and were perhaps identical with the old Issedones. The Tunghu, deceived by the apparent compliance of Mete, were first attacked and dispersed (209 BC); they withdrew to the highlands of modern Manchuria. A part of the Sien-pe Tartars (Hsien pi, Tungusians), a people living further to the east, who also suffered from the attacks of the Huns, migrated to Korea and Japan. On the east the sea fixed an impassable limit to further shiftings of the position of nations; but on the west, where the Huns now hurled themselves against the Yue tshi, the movement had room to spread more widely. The Yue tshi first retreated before the advance of their assailants only into more remote regions of their own country, to the basin of the Tariin (177 BC). After the death of Mete (c. 170 BC) the power of the Huns increased at first. The Yue tshi were completely beaten, and the Usun, one of the fair-haired nomad tribes of Central Asia, were driven from their homes in Kansu to the west, where, following on the steps of the Yue tshi, they caused these latter to fly before them from the Issik-kul farther southward. 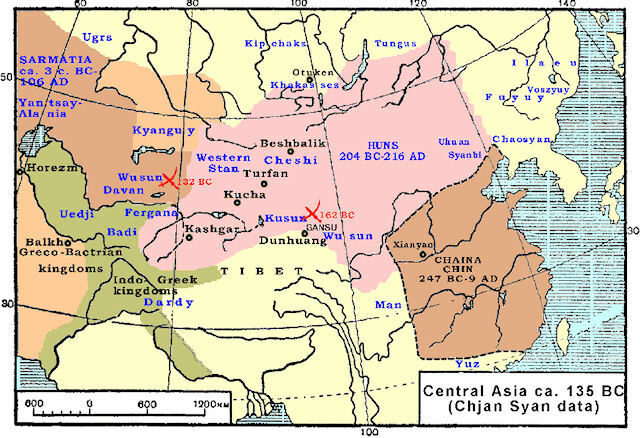 The sphere of the Mongolian language and race was thus considerably extended by the Huns. The growing power of the Hun empire was most dangerous to China, the frontiers of which were perpetually ravaged, and seemed still more threatened, since the Tibetan nomads, who were settled in the western mountains, now began to form alliances with the Huns, and to undertake their raids on a mutual understanding. They attempted to recover their old territory, but suffered a second crushing defeat from his successor, which produced a division of the nation (165 BC). The smaller part found homes south of the Nanshan range; but the bulk of the people, the " Great Yue tshi," did not turn southward, but followed the natural trend of the country westward. Driven out from the Tarim basin, they crossed the Tianshan mountains and sought refuge in the pasture lands on the confines of Europe and Asia, the old arena of the Scythian nomads. On the Issik-kul they came across a shepherd people of Iranian stock, the She, who were compelled to fly before the overwhelming invasion into Ferghana. 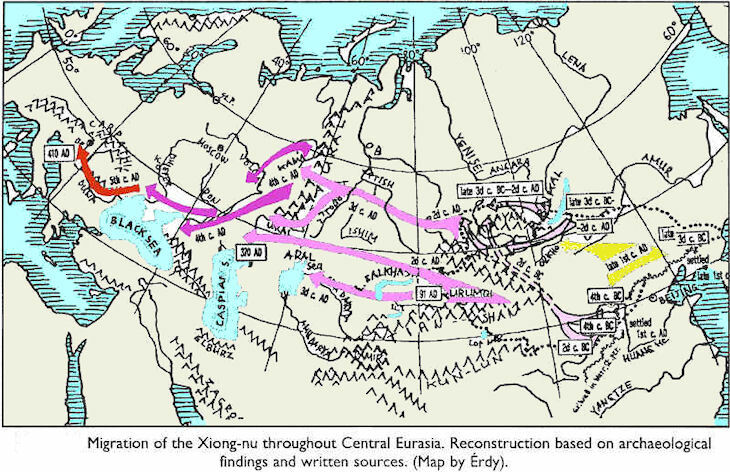 Meanwhile the Huns had succeeded in conquering a part of Northwest China and East Siberia. A policy was adopted with regard to the subjugation of nomad tribes which was not unknown to other conquering nations of Central Asia, and became the chief cause of the extraordinary intermixture of races among the Central Asiatics. The vanquished tribes were not dislodged or made tributary, but to some degree absorbed, since the women were distributed among the conquerors and the young men enrolled in the army. In their life and customs the Huns appear as a people who depended for their existence on cattle-breeding, hunting, and to some extent agriculture, but gave the fullest play to their warlike propensities. The place of honor was given to the young and efficient warriors, and old age was despised. No one was reckoned to have reached full manhood until he had slain at least one foe. The method of fighting which afterward decided the battles of the Western Huns and Mongols - the charge of mounted archers, the feigned flight, and the storm of arrows which laid low the unsuspecting pursuer - was already developed among the ancient Huns, as well as the division of the army into two wings. This military system was maintained in times of peace also. The ruler, Shenyu, who to some degree commanded the center, had two supreme officials, the Tuchi (Duchi), under him, one of whom was over the eastern, the other over the western, wing or division of the army and the country. The trend from west to east in the geographical configuration of Asia is again recognisable in this arrangement, which was also adopted by the later great nomad empires. The Tuchi and a number of other high officials could only be chosen from the kinsmen of the Shenyu, who with some few other families had the virtual government of the empire in their hands. It was no use merely to repel these attacks. If the Chinese wished to free themselves from then: oppressors, they were compelled to advance along the old road from Kansu to the Tarim basin, take up strong positions there, separate the southern nomad countries from the northern, and at the same time obtain possession of the indispensable bases and halting-places of the Hun armies to the south of the desert of Gobi In this way the Western trade also, which had previously depended for its prosperity on the caprice of the nomads, was certain to come under the influence of China. The energetic emperor Wu Ti (140-87) staked everything on the execution of this colossal plan, entered into alliances with the Yue tshi and Usun, by this means threatening the Huns in the rear, and finally forced them by successful engagements to retire to the north of Mongolia (120). The first step in the advance westward was thus taken, and a new era inaugurated in the foreign policy of China. The Hun empire still maintained its position in the north for some time, and even considerably extended its power toward the west, but the old sovereignty was a thing of the past. The attacks of the neighbouring peoples and disputes for the crown began to disorganise the constitution, until finally, about 50 BC, the empire broke up into a southern and a northern part, of which the first recognised the Chinese suzerainty, while the northern still maintained its independence. Transitory successes could no longer check the fall of the Hun power, for the Chinese could now play off the southern Huns successfully against the northern Huns, and instigate other nomad tribes against the northern empire, which was encircled by enemies. The northern Hun empire finally, in 84 AD, succumbed to the attacks, in which even Siberian tribes, and especially the Sien pe Tartars, formerly the victims of the Huns, but now grown strong enough for a new conflict, took part. Some of the Huns fled westward, where they were destined yet to attain great prosperity ; the rest were scattered or were absorbed in the Sien pe, who now possessed the greater portion of Mongolia. The Southern Huns held out longer; at one time as subjects and allies of the Chinese, at another as their opponents, or as supporters of pretenders to the throne. But after 142 AD there was an end to the southern empire of the Huns, though not to the influence of the people on the destinies of China. The Huns, who had familiarised themselves with the Chinese civilization, gradually began to exert a political influence, and finally emperors of Hun origin for a time sat on the throne of the Celestial Empire, or on those of the fragments into which it broke up. But they no longer ruled as nomad princes; they had become genuine Chinese in act and thought.